The Battle of Fort Ligonier (also known as the Battle of Loyalhanna or the Battle of Loyal Hannon) was a battle of the French and Indian War. 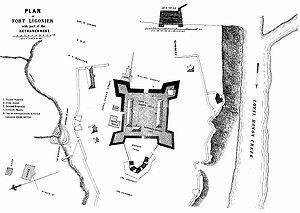 On 12 October 1758, French and Indian forces directed from nearby Fort Duquesne were repulsed in an attack on the British outpost of Fort Ligonier, then still under construction. In between the French and the British, large areas were dominated by native tribes. To the north, the Mi'kmaq and the Abenaki still held sway in parts of Nova Scotia, Acadia, and the eastern portions of the province of Canada and present-day Maine. 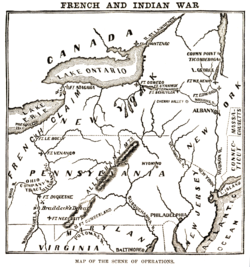 The Iroquois Confederation dominated much of present-day Upstate New York and the Ohio Country, although the latter also included populations of Delaware and Shawnee. Further south the interior was dominated by Catawba, Creek, Choctaw, and Cherokee tribes. When war broke out, the French also used their trading connections to recruit from tribes in western portions the Great Lakes region (an area not directly subject to the conflict between the French and British), including the Huron, Mississauga, Ojibwa, Winnebago, and Potawatomi. The British were supported in the war by the Cherokee until differences between them sparked the Anglo-Cherokee War in 1758, and also by the Iroquois. In 1758 the Pennsylvania government successfully negotiated the Treaty of Easton, in which a number of tribes in the Ohio Country promised neutrality in exchange for land concessions and other considerations. Most of the other northern tribes sided with the French, their primary trading partner and supplier of arms. The Creek and Cherokee were targets of diplomatic efforts by both the French and British for either support or neutrality in the conflict. It was not uncommon for individuals or small bands to participate on the "other side" of the conflict from formally-negotiated agreements.